BACKGROUND AND PURPOSE: Ecchordosis physaliphora (EP), found in about 2% of autopsies, is a clinically inconspicuous notochordal remnant appearing at the dorsal wall of the clivus. To our knowledge, a systematic review of its MR features does not exist. The aim of this study was to describe the MR imaging findings of incidentally found retroclival EP with special respect to its differentiation from intradural chordomas. METHODS: We reviewed 300 consecutive 1.5-T MR imaging studies that included thin-section transverse T2-weighted images of the skull base for the presence of a retroclival EP. In cases in which an EP was identified, two neuroradiologists observed MR signal intensity characteristics, contrast enhancement, size, form, stalk of EP, and signal intensity changes of the adjacent clivus. RESULTS: Five cases with retroclival EP were found (incidence, 1.7%). In all cases, the ecchordoses was hyperintense on T2-weighted images and hypointense on T1-weighted images. Contrary to the reported findings in chordomas, none of the lesions showed contrast enhancement. In four cases, there were signal intensity changes in the adjacent clivus. A stalklike connection between clivus and EP was seen in three patients. CONCLUSION: Because of the benign character of EP and the difficulties in its histopathologic differentiation from chordomas, precise knowledge of the radiologic characteristics of EP is important. 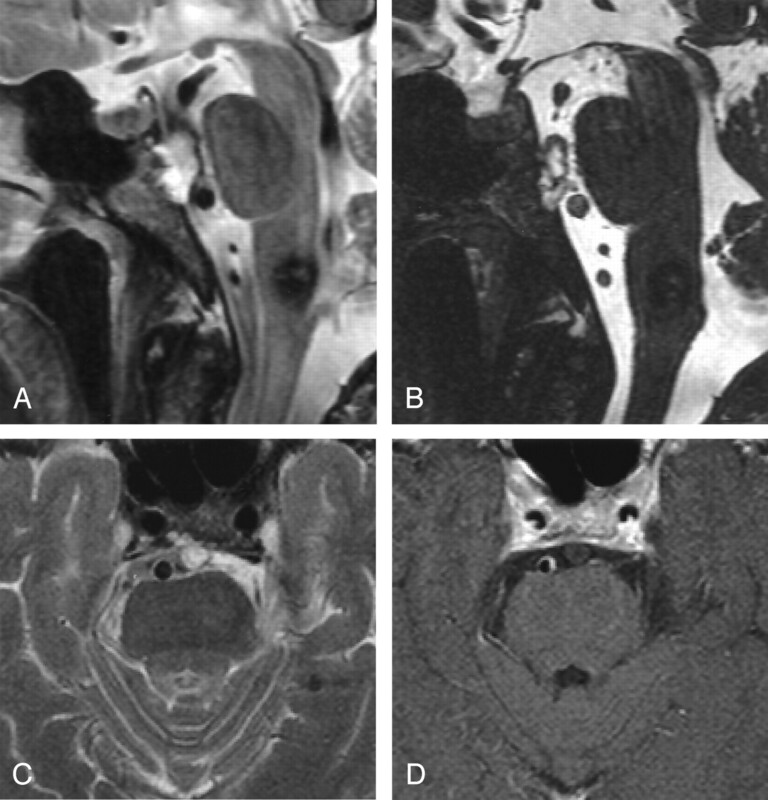 On the basis of these five cases and a review of literature, contrast enhancement and the presence of clinical symptoms seem to be highly reliable parameters in the differential diagnosis of intradural chordoma and EP. Ecchordosis physaliphora (EP) is a small, gelatinous tissue that is considered an ectopic notochordal remnant (1–4). This tissue is located in midline of the craniospinal axis, reaching from the dorsum sellae to the sacrococcygeal region. Intracranial EP is typically found intradurally in the prepontine cistern, where it is attached to the dorsal wall of the clivus via a small pedicle (1, 2, 5). Ecchordoses in this region are usually asymptomatic and found in about 2% of autopsies (1, 6, 7). Only a few reports in the literature provide the detailed radiologic features of a retroclival EP (4–6, 8), with none in neuroradiology journals, to our knowledge. The purpose of this study was to describe the MR imaging findings of five cases of asymptomatic retroclival EP. On the basis of the cases reported in the literature and the current knowledge about remnants of the notochord, there is no significant foundation for defining criteria to distinguish simple notochordal remnants from their aggressive counterparts (i.e., chordomas). Such criteria would be helpful in identifying cases that require further procedures, such as follow-up or surgery. From January to September 2003, we reviewed 300 consecutive MR imaging studies that included thin-section (2 or 3 mm, gap of 10%) transverse T2-weighted images of the skull base. Patients with a known clival tumor (e.g., chordoma) were excluded. All MR imaging studies were screened for the incidental appearance of a small, retroclival, intradural mass consistent with an EP. If found, the cases were included for further evaluation. In all included patients, we searched for any previous MR imaging examinations or recent follow-up, if available. All MR imaging examinations had been performed on a 1.5-T unit (Sonata; Siemens, Erlangen, Germany). We evaluated T2-weighted turbo spin-echo images (3 mm, gap of 10%, TR/TE of 4000–4320/90–109) and T1-weighted images obtained before (spin echo, 3–5 mm, gap of 10–20%, TR/TE of 600/12) and after (spin-echo flow compensated, 3–5 mm, gap of 10–20%, TR/TE of 615–647/17) the intravenous administration of gadopentetate dimeglumine, if available. Two independent senior neuroradiologists (W.K., T.N.) observed the T1 and T2 signal intensity of the EP, its contrast enhancement, its size and form, the presence of a stalk, and the signal intensity changes in the adjacent clivus by consensus reading. We identified five cases with an incidental finding of an EP. Therefore, the incidence in our study population was 1.7% (five of 300). All five patients had T1-weighted images, T2-weighted images, and contrast-enhanced T1-weighted images available for evaluation. In one patient (case 1), images from an earlier MR imaging examination were available. Patient data and MR characteristics of the ecchordoses are shown in Table 1. Patient 1 underwent a control examination for a known cavernoma in the medulla oblongata. At the present examination the patient was asymptomatic. In this patient, a thin-section, sagittal constructive interference in steady state (CISS) sequence had been included in the study (Fig 1). An older MR imaging examination from 2 years earlier was available; the images showed a constant size of the EP as far as it was assessable on thick MR sections. Patient with known cavernoma in the medulla oblongata. A, Sagittal T2-weighted image shows an incidental ecchordosis physaliphora at the dorsal wall of the clivus. B, Intradurally, this is best delineated with a sagittal CISS sequence (3D, 1 mm, TR/TE of 12.06/6.03, flip angle of 70°). C, Transverse 3-mm T2-weighted image shows hyperintense changes in the dorsal clivus that have a broad connection to the intradural part. D, No enhancement is seen on this 3-mm contrast-enhanced T1-weighted image. Patient 2 had several spinal cord lesions suggestive of multiple sclerosis. The patient had no symptoms affecting the cranial nerves or brain stem. There were no MR signal intensity changes in the cerebral parenchyma except of a demyelinating lesion at the junction of medulla oblongata and cervical myelon. MR images showing the EP are illustrated in Figure 2. Patient with multiple myelitic lesions. A and B, Sagittal and transverse T2-weighted 3-mm images incidentally show a round, retroclival ecchordosis physaliphora being spared in the dark signal intensity of CSF-related pulsation artifacts. C, T1-weighted 5-mm image does not show this finding because of the similar signal intensity compared with that of CSF. Patient 3 had a known bronchial carcinoma and was symptomatic with diplopia corresponding to double-sided palsy of the third and fourth cranial nerve. MR imaging revealed a tumor infiltration of the cavernous sinus on both sides. As a metastatic tumor infiltration of the clivus was not present, and lumbar puncture did not show signs of carcinomatous meningitis, we regarded the small retroclival mass as an incidental EP. In case 4, the patient had acute complaints of dizziness with unilateral vestibular loss. MR imaging was performed to rule out a vestibular schwannoma. The findings were unremarkable except unspecific hyperintense T2 signal intensity changes in the pons and a small retroclival EP. Patient 5 was a 10-year-old boy with recurrent mesencephalic infarction. MR imaging had been performed because of another episode of acute intermittent diplopia. Diffusion imaging showed a small acute ischemia in the mesencephalon. Otherwise, the images of the cerebrum were normal. A small EP was found in the retroclival CSF space. In all five patients, the ecchordoses were hyperintense on T2-weighted images and hypointense on T1-weighted images. All signal intensity changes were homogenous. No EP showed contrast enhancement. In four of five cases, signal intensity changes in the adjacent clivus had characteristics similar to those of the intradural part. In three cases, a connection or stalk was seen between the clivus and the intradural EP. Phylogenetically, the notochord is the primitive skeleton of vertebrates. As the axial skeleton develops, the notochord becomes incorporated into the vertebral column along most of its length and ultimately contributes to the formation of the nucleus pulposus of the intervertebral disk. However, at the two poles of the skeleton—the dorsum sellae and the sacrococcygeal region—the fate of the notochord is more variable and correlates with the presence of aberrant notochordal tissue in later life (9). Intracranially, the notochord describes a sigmoid curve through the clivus. Thereby, it reaches the surface of the bone three times (posterior clivus, pharyngeal surface, dorsum sellae), possibly resulting in ectopic location of notochordal tissue (9). Luschka first described the finding of pathologic ectopic notochordal tissue at the posterior clivus in 1856 (1, 7). In 1857, Virchow gave the first microscopic description and called the lesion ecchondrosis physaliphora, believing it to be a process affecting the cartilage of the spheno-occipital synchondrosis. One year later, Müller proposed a notochordal origin. In 1894, Rippert found notochordal remnants in 2% of random autopsies and coined the term ecchordosis (1). Although the term ecchordosis physaliphora for the benign, hamartomatous lesion at the clivus is now widely accepted, there is some confusion about its distinction from intradural chordoma (1, 4, 7). Chordomas, the malignant counterparts of ecchordoses, are rare neoplasms of notochordal origin constituting 2–4% of primary bone tumors, with a lower prevalence than EP (2, 10, 11). Moreover, in contrast to EP, which is usually intradural, chordomas mostly arise extradurally and lead to bone destruction. Rare cases of extraosseous intradural chordoma have been reported and are supposed to have a prognosis better than that of classical chordomas (1, 4, 12). Small samples of ecchordoses and chordomas are—apart from an infiltrative growth in chordomas—indistinguishable on the basis of histology, immunohistochemistry, and ultrastructural study; this observation supports the concept of a common origin from the notochord (1, 2, 7, 11, 12). Although some histopathologic findings, such as hypocellularity, sparse pleomorphism, and absence of mitoses (6, 13), may be helpful for differentiating EP from chordoma, they are not diagnostic criteria. The MIB-1 labeling index as a marker of proliferation rate is considered helpful in distinguishing EP from chordomas and reportedly well correlated with recurrences in chordomas (6, 12, 14, 15). However, it is not clear whether an EP can be a precursor of a chordoma (4, 11, 12, 16). Lately, confusion has arisen around the issue of whether intradural chordoma and large EP are different entities or whether they can be subsumed under one term (1, 4, 11, 17). Wolfe et al (1) proposes the term intradural chordoma for all lesions, whereas Rodriguez at al (4) believes that all instances of symptomatic, intradural, extraosseous physaliphorous cell growth should be classified as giant or symptomatic EP as long as the existence of an intradural chordoma is not definitely proved. Although chordomas are generally associated with symptoms, an EP is usually asymptomatic. Nevertheless, some reports have described symptomatic retroclival ecchordoses (8, 18). Stam et al (18) described a case with fatal pontine hemorrhage caused by an EP. Macdonald et al (8) reported a patient with a CSF fistula secondary to an EP. All other histologically confirmed cases of EP had nonspecific symptoms, such as headache or dizziness, that are only questionably associated with the ecchordosis itself (4–6, 15) or incidental findings (19). In contrast, all reported cases of retroclival intradural chordoma had brain stem symptoms or cranial nerve palsy (1, 12, 16, 17, 20, 21). In the literature, we found only six cases of retroclival EP documenting the radiologic findings (4–6, 8, 15, 19) (Table 2). CT seems to have limited utility because of the small size of the lesion and the possible artifacts in the posterior fossa. Magnified bone windows and CT cisternography have been useful in determining the appropriate diagnosis (5, 8). A tiny, osseous stalk of the ecchordosis has also been reported (5). As shown in this study, MR imaging is of great use in detecting and precisely localizing EP at the typical site, when thin-section images are obtained. As in all reported giant or symptomatic cases, EP appears hypointense on T1-weighted images and hyperintense on T2-weighted images (4, 5, 6, 8, 15, 19). These signal intensity characteristics resembling those of CSF limit visibility on 5–6-mm-thick transverse images. CSF pulsation artifacts in the prepontine cistern seem to be useful in recognizing these lesions on thin T2-weighted images, as the hyperintense EP is spared within the dark signal intensity of pulsation artifacts. Reports of symptomatic cervical EP at the occipitocervical junction show similar MR signal intensity characteristics (13, 22). A contrast enhancement study adds important diagnostic information. None of our cases and none of the cases reported in literature (4–6, 15, 19) have shown a substantial enhancing effect in retroclival EP. In contrast, chordomas generally enhance after application of contrast medium (10). Regarding the reported cases of intradural chordoma examined with MR imaging (12, 16, 17, 20), all of them show considerable contrast enhancement (Table 2). It was proposed that an enhancement effect of a retroclival, intradural lesion might indicate a chordoma or another malignant tumor (e.g., metastasis), whereas lack of enhancement might be a sign of an EP (5). In our study, we did not have a histologic confirmation of the diagnosis EP. Apparently, patients with this asymptomatic and incidental lesion do not undergo surgery. However, in all of our cases, we feel confident about the diagnosis because of the typical appearance in comparison to the pathologic descriptions. Thin-section T2-weighted images can precisely demonstrate retroclival EP. Typically, EP appears hypointense on T1-weighted images and hyperintense on T2-weighted images, and it shows no contrast enhancement. In most cases, the T2 signal intensity changes reach to the posterior wall of the clivus. The absence of clinical symptoms and lack of contrast enhancement on MR imaging might help in distinguishing EP from other retroclival masses. Follow-up examinations of more patients with EP will be helpful for establishing precise diagnostic criteria and guidelines. Accepted after revision February 29, 2004.